We understand the importance of taking care of your eyes from an early age, which is why children’s vision is one of our specialities. During the first twelve years of our lives, as much as 80% of learning is accomplished through our vision. Yet research has shown that one in five children, have an undetected vision problem. Without professional help, it’s difficult for children to identify and communicate any eye problems. Children’s eyes have a degree of plasticity up until the age of seven, which means certain potentially permanent issues can be resolved if they are caught early enough. Certain eye conditions can cause permanent damage if not caught early, so we are committed to testing and monitoring children’s ocular health and vision as early as possible. How Do I Know If My Child Has a Problem with Their Sight? At what age and how often should my child have their eyes examined? We can examine your child’s eyes no matter how young they are. Our specialised testing equipment means that if your child does not know the alphabet, or perhaps lacks in confidence, we can use alternative tests to enable us to examine their eyes accurately. The National Screening Committee recommends that full screening by an optician should begin at age four to five years. After the first test it is advisable to return every year or as recommended by your optician. It is particularly important if Mum or Dad wear glasses. If your child requires vision correction, we’ll make the process easy, comfortable and even enjoyable for your child. We stock a full range of children’s frames to to suit all styles and budgets. If you choose a frame from our €50 range or above you can get a second pair of glasses FREE. We also stock a range of designer and specialised frames made from lightweight titanium or memory metal with sprung sides. There is also the option of having thinner, more lightweight and reflection-free lenses fitted to your child’s glasses, to further improve the quality of your child’s vision. Contact lenses are a popular choice for children playing sports such as football, tennis and rugby. We have extensive experience in fitting younger patients with contact lenses. Along with conducting the test, providing the prescription and supplying the lenses, we will also help ensuring you and your child are comfortable with inserting, removing and caring for them. 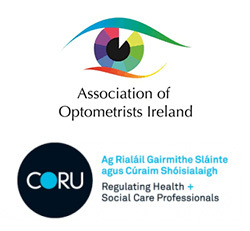 To view frequently asked questions and answers for parents thinking about contact lenses for their child please click here.